U-turn at the EPO - Patent my French! Who said patent law is boring? Sometimes, it can be as hectic as an episode of 24. Look at the unitary patent package. One day it is supposed to enter into force anytime soon, then a UK referendum creates mayhem. In the following episode, the project is back on tracks. Next thing you know, bang, a constitutional challenge in Germany pops up in the season’s finale, and this is your cliffhanger until the next season. These days, the same seems to be true of the issue of patentability of plants and animals obtained by essentially biological processes. Lionel Vial reports. Some news regarding the patent eligibility of plants or animals obtained by essentially biological processes, which was previously discussed here and there on this blog. On June 29, 2017, the Administrative Council of the EPO took a decision amending Rules 27 and 28 of the Implementing Regulations to the EPC. (c) a microbiological or other technical process, or a product obtained by means of such a process other than a plant or animal variety. 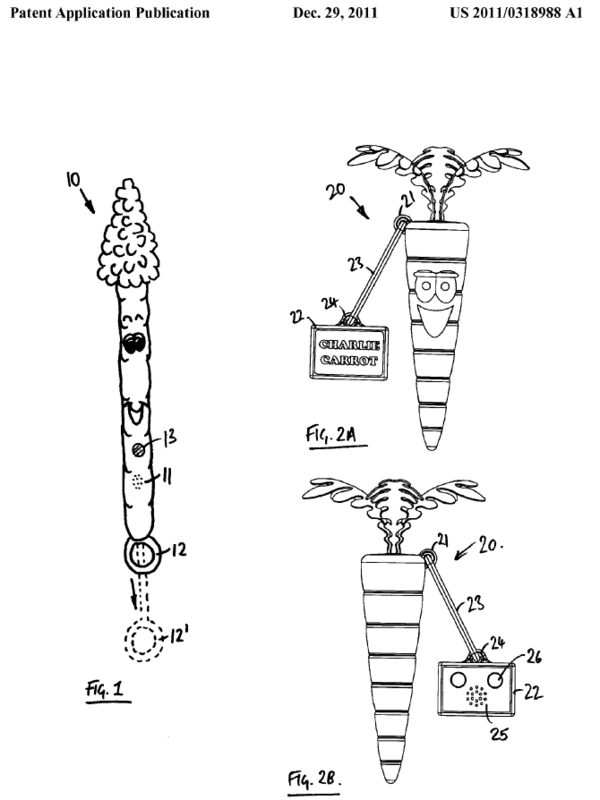 Breaking news: Archie Asparagus and Charlie Carrot remain patentable. The decision also provides that amended Rules 27 and 28 entered into force on July 1, 2017 and that they apply to European patent applications filed on or after this date, as well as to European patent applications and European patents pending at that time. The interpretation of the amendments appears to be quite straightforward: plants or animals which are exclusively obtained by means of an essentially biological process are not patent eligible. To make a long story short, this decision aims at putting an end to a story which began with decisions G 2/12 (Tomatoes II) and G 2/13 (Broccoli II) of March 25, 2015 of the Enlarged board of appeal (EBA) of the EPO. These decisions held that the exclusion of essentially biological processes for the production of plants in Article 53(b) EPC does not have a negative effect on the allowability of a product claim directed to a plant or plant material such as a fruit or plant part. The EBA decisions caused a certain turmoil in Europe, triggering fears among the public that producers and growers of plants obtained by essentially biological processes might be patent barred from practicing their activity. As a consequence, France excluded from patentability products exclusively obtained by essentially biological processes for the production of plants and animals on August 8, 2016 (the Netherlands and Germany had already done so in 2010 and 2013). Furthermore, the European Commission issued a notice on November 8, 2016 taking the view that the EU legislator’s intention in the so-called Biotech Directive 98/44/EC was to exclude from patentability products (plants/animals and plant/animal parts) that are obtained by means of essentially biological processes. Eventually, a notice from the EPO dated November 24, 2016 informed the public that follow-up measures further to the Commission’s notice were under discussion with representatives of the member states of the European Patent Organisation. Pending this discussion, proceedings before EPO examining and opposition divisions in which the decision entirely depended on the patentability of a plant or animal obtained by an essentially biological process were stayed ex officio. So, is the decision of the Administrative Council of June 29, 2017 the end of the story? Well, we are not so sure. Indeed, there are at least two points which will require some clarification in our opinion. The first point regards the interpretation of the word “exclusively”, which happens to be found nowhere in the EPC nor in the Biotech Directive. Besides, to our knowledge, no guidance has been offered by the legislator either (the Administrative Council in this case) on its intent when using that word. Let’s try by ourselves then. The first interpretation which comes to mind is that “exclusively” is merely meant to emphasize that plants or animals which are obtained by means of a mix of an essentially biological process and a non-essentially biological process are not excluded from patentability. In that case, “exclusively” may seem a little superfluous, as simply providing that European patents shall not be granted in respect of plants or animals obtained by means of an essentially biological process would probably also have made the job. The second interpretation is that “exclusively” relates to the different ways the plant or the animal can be obtained. According to that interpretation, European patents would be denied only for plants or animals which at the filing date could only be obtained by an essentially biological process, whereas plants or animals which at the filing date could be obtained by an essentially biological process but also by an independent non-essentially biological process would still be patentable. As readers will surely have noticed, this interpretation is reminiscent of decision G 2/06 of the EBA according to which, with respect to Rule 28(c) which prohibits the patentability of uses of human embryos for industrial or commercial purposes, the prohibition only concerns claims directed to products which – as described in the application – at the filing date could exclusively be prepared by a method which necessarily involved the destruction of the human embryos from which said products are derived (even if said method is not part of the claims). It could thus be possible, under this interpretation, that a European patent could still be granted for a claim pertaining to a plant or an animal, which is only described in the application as being obtained by means of an essentially biological process, provided this plant or animal could also have been obtained by a non-essentially biological process at the filing date. The second point to be clarified regards the application of amended Rules 27 and 28 EPC to European patent applications and European patents pending on July 1, 2017, i.e. filed before their entry into force, which in our opinion does not follow as evidently from the decision of the Administrative Council as the latter may consider. Here again, G 2/06 offers some guidance. The EBA further decided in that case that Rule 28(c) EPC (formerly Rule 23d(c) EPC), which was introduced by decision of June 16, 1999 of the Administrative Council of the EPO, applied to all pending applications, including those filed before the entry into force of the rule. It seems quite clear. The introduction of this new chapter without any transitional provisions, can only be taken as meaning that this detailed guidance on what was patentable and unpatentable was to be applied as a whole to all then pending applications. It has not been argued that Rule 28 (formerly 23d) EPC took away the possibility to patent anything which had previously been regarded as patentable under Article 53(a) EPC, nor that the Directive did so (see in this respect the reference in Art. 6(1) to what is contained in Article 53(a) EPC as well as the reference to the TRIPS Agreement in Article 1(2)). Already by 1984 (see Dolder, Mitteilungen der Deutschen Patentanwälte, 1984, 1, “Barriers to patentability of biotechnological inventions under the EPC”), instrumentalization of the human body (as opposed to parts of it), thus degrading it to an object of technology, had been considered as a barrier to patentability. There is no indication that the commercial exploitation of human embryos was ever regarded as patentable. Well, in the case at hand, it appears that plants or animals obtained by means of essentially biological processes were indeed previously regarded as patentable under Article 53(b) of the EPC (remember G 2/12 and G 2/13?). Accordingly, there does appear to be a ground to challenge the application of amended Rules 27 and 28 EPC to applications and patents filed before July 1, 2017 before the boards of appeal of the EPO. In fact, clarifications will surely be brought to the above points, as the agriculture industry is not deprived of deep-pocketed applicants who will fiercely defend their applications before the examination/opposition divisions and boards of appeal of the EPO. Thank you Lionel. Let’s wait for the next episode then. But, dear readers, don’t hold your breath, though. 24 hours is not exactly the kind of time scale we are talking about in the patent law saga. Pingback: A new hope - Patent my French!